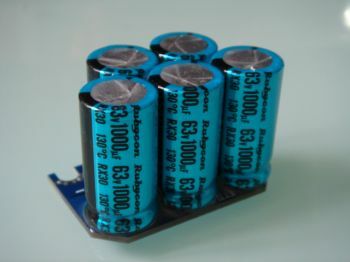 Etti Capacitor Bank for High Voltage 63V 5000u. Recommended for up to 14s Maximum. WARNING: If any capacitors seem to bulge, start to deform, leak or pop, stop using them IMMEDIATELY!!! If Capacitors fail they can explode and cause injury. 1) Heating, causing a capacitor to swell and explode. 2) Drying of the liquid electrolytic inside from various causes, such as defects, leaking and even cleaning. 3) Capacitors re-form over time to meet a usual and expected voltage. Surges that are not normal can cause sudden failure. 4) The older they get the greater the incidence of failure. 5)High-current motor setup will tend to kill the caps quickly (because of the large voltage changes).